author Kaisler, D.; Harris, W. E.; McLaughlin, D. E.
John Herschel discovered this globular cluster during his observations from Bath in Southern England in 1827, and cataloged it as h 2029. 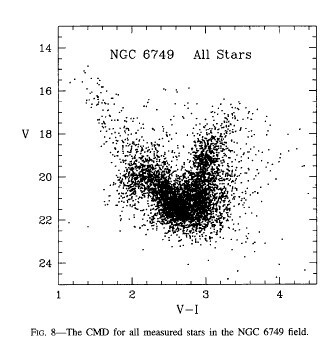 NGC 6749 was also cataloged as Berkeley 42 or Be 42 (in an open cluster catalog). Rosino, L.; Ortolani, S.; Barbuy, B.; Bica, E.
Kaisler, D.; Harris, W. E.; McLaughlin, D. E.